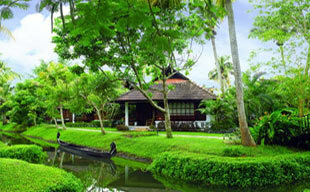 God's own country tour is great enough to mesmerize a traveller with the richness of the land and experiences in Kerala. Fondly referred to as a state bestowed with heavenly blessing, Kerala has a divine aura that enthralls and overwhelms everyone during the visit every time. The awe, wonder and surprise of this destination are associated with the bewitching backwaters, sunny beaches, wondrous wildlife and divine kingdoms, making this destination more enticing and incredible. 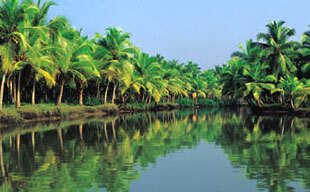 Welcome to Kerala famous as the God's Own Country. Upon arrival, Incredible India Tour representative will greet you at Trivandrum Airport / Railway Station and assist your transfer to the hotel in Kovalam. Kovalam is one of the premier beaches of Kerala. Known as 'Hippie's haven' this beach is bestowed with a heavenly setting unique to its identity. This beach town is known for its rocky outcroppings, coming together to form the famous crescent of three beaches. Lighthouse, Havah and Samudra are the names of three unique seafronts comprising the beauty of Kovalam. Overnight stay at the Hotel/Resort. Enjoy the sumptuous breakfast in the resort. Later proceed for the sightseeing of Thiruvananthapuram / Trivandrum. Thiruvananthapuram in colloquial language means Ananthapuri, 'the city of Anantha, the divine sesha serpent associated closely with Lord Vishnu. On this divine serpent only, Lord Vishnu or Padmanabhaswamy reclines. The day's illustrious sightseeing includes a visit to the richest temple of the world, Padmanabhaswamy Temple. The temple enjoyed strong patron ship of Travancore rulers, contributing to the riches of the temple.Moving further towards the south east of temple, you will find Kuthira Malika Palace Museum, the next destination of God's own country tour. Constructed in the form of typical Keralan architecture, this museum was previously a palace built by Swathy Thirunal Rama Verma. Literally if we translate the term Kuthira Malika, we will get to know it was the mansion of horses. These horses can be seen in the intricate wood carvings on the exterior walls of the palace. These horse shaped wall brackets support the southern roof of this structure. A portion of Kuthira Malika has been converted to a Palace Museum that exhibits the glorious assets and treasured preserves of Travancore rulers. The priciest collection includes Kathakali mannequins, crystal chandeliers, Belgian mirrors, paintings, armaments, musical instruments, traditional furniture and other preserved artifacts. The use of ivory is prominent in this museum. The royal thrones made from Bohemian crystal and ivory embossed with 'conch shell', the emblem of Travancore kingdom also define the richness of the rulers. Veli Tourist Village, the next destination of the city tour is a picnic spot where tourists can enjoy paddle boating in the lagoon. This excellent waterfront offers a wide range of aqua entertainment facilities like fishponds, wading pools and landscaped garden. During evening, visit Shangumugham Beach for an amazing sunset experience on a Kerala beach. Overnight stay at the Hotel/Resort. Post sumptuous breakfast; proceed towards Kollam, the cashew capital of Kerala. On arrival, check in at the hotel. Further proceed towards Amritanandamayi Ashram, the birthplace of the hugging saint, Amma Amritanandamayi Devi. Located on the Alappad Island, this ashram is joined to the mainland by Amrita Setu footbridge. Day is at leisure. Evening visit Kollam Beach for a magical sunset, adding on to the fulfillment of Day 3. Overnight stay at the Hotel/Resort. Post breakfast; proceed towards boat jetty to experience the cruise on backwaters of Varkala for Kettuvallam stay. Bedecked with luxury, a Kettuvallam is a beautifully designed houseboat. This houseboat cruise is one of the most awaited moments of Kerala tour. The backwaters of Kerala is a unique product that offer tourists a chance to romance the innocent countryside lined by coconut trees, paddy fields and displays rural life and fishing as its attraction. Overnight stay in the Houseboat. Enjoy the sumptuous breakfast on the houseboat as you are transported to the Venice of the East, Alleppey. Disembark at Alleppey and proceed towards Cochin (Kochi). On arrival, check in at the hotel. Proceed for a half day city sightseeing tour of Kochi. This time kept city is still known for its preserved history of colonial times. A city tour is a walk down the memory lane. The major tourist attractions are Chinese Fishing Nets, St. Francis Church, Santa Cruz Basilica, Jewish Synagogue, and Mattancherry Palace/Dutch Palace. Overnight stay at the Hotel/Resort. Enjoy the breakfast at the hotel. Check out the hotel and transfer towards Kochi Airport / Ernakulam Railway Station with incredible memories of God's own country tour.